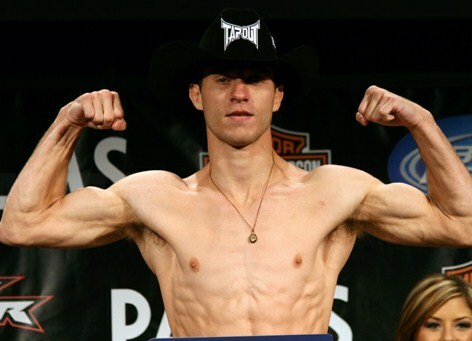 Donald "Cowboy" Cerrone is undefeated (2-0) so far in his UFC career. Canadian lightweight John “The Bull” Makdessi (9-0), due to injury, has withdrawn from his August 14 scheduled bout against Paul Taylor (11-6-1, 1 NC) at “UFC Live: Hardy vs. Lytle” (UFC Live 5) in Milwaukee, Wis. Stepping in for “The Bull”, will be a man who has actually ridden a few bulls, Donald “Cowboy” Cerrone (15-3, 1 NC), who is coming off an impressive three round unanimous decision win over Vagner Rocha (6-2) at UFC 131 earlier this month. Cerrone made his UFC debut in February when he scored a second round submission win over Paul Kelly (11-4) at UFC 126. He is currently riding a four fight win streak. Kelly is in desperate need of a win. He has only won three of his nine bouts inside the UFC Octagon, including his most recent fight at UFC 126 when he scored a second round knockout via head kick over Gabe “Godzilla” Reudiger (17-7). UFC Live 5 will featured a welterweight main event between veteran Chris Lytle and Nottingham’s Dan Hardy. For the complete line-up for this card refer to ProMMAnow.com’s Upcoming Events page.